A delicious No-Bake Rolo Tart that will be the perfect Showstopper for any occasion! SO, I thought it was time for something delicious. 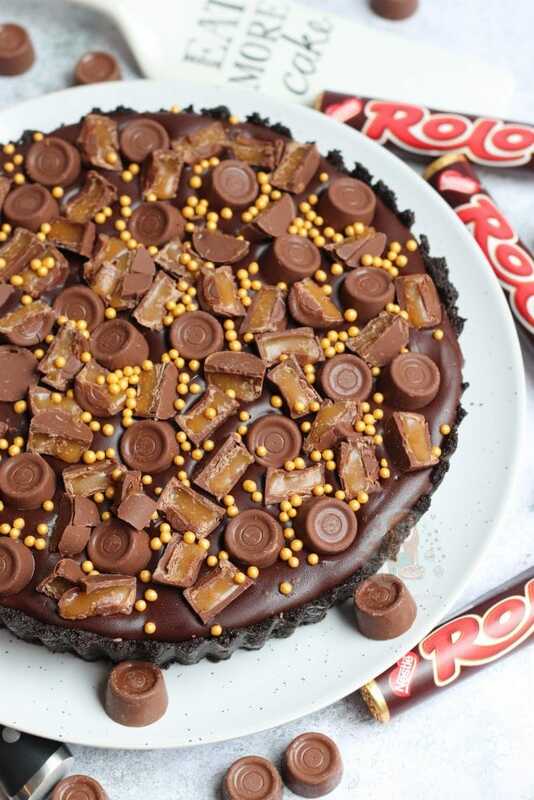 After the success of my No-Bake Caramel Rolo Cheesecake, I thought it was time for another Rolo recipe as you all seem to LOVE them! Like, I can’t deny it.. 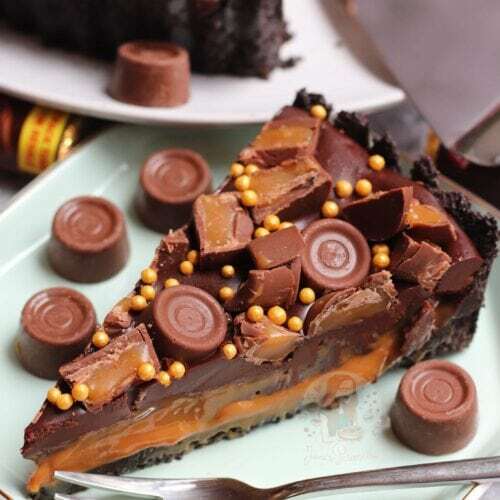 I love Rolo recipes! Yum. 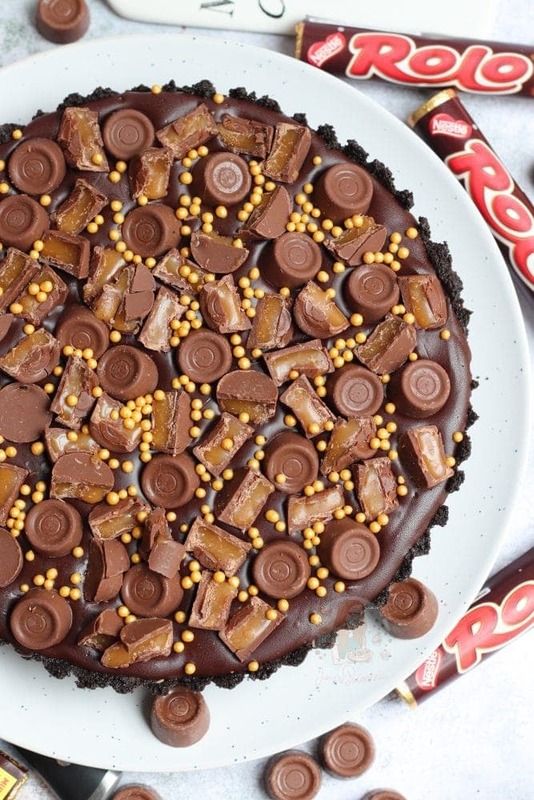 But anyway… I wanted it to be another No-Bake recipe for now as I was craving a delicious dessert, and I find baking with Rolos tricky because of the caramel in them. I decided to go for an Oreo crust on this dessert because I adore the flavour of Oreos, and they work remarkably well with all sorts of different fillings. 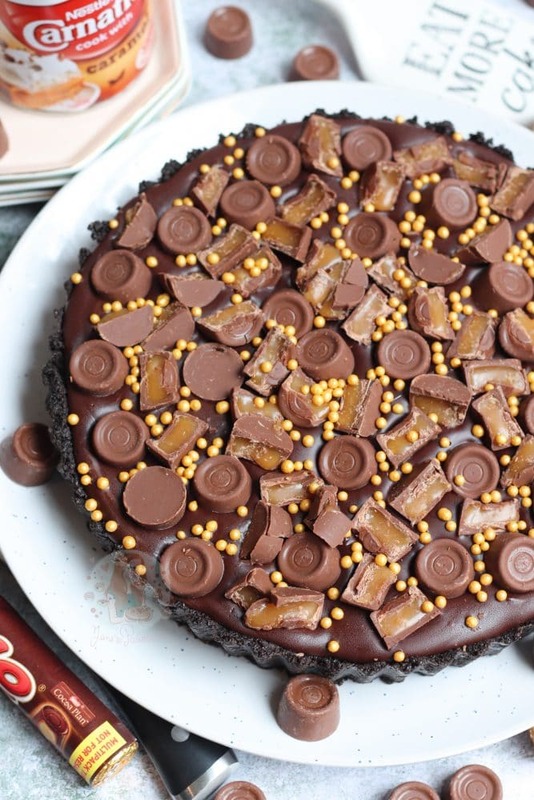 My No-Bake Oreo Chocolate Tart is a good example of this! I also love how the crust looks with the contrast of the caramel.. but we all know thats just a bonus. I’m really making excuses for having such an indulgent dessert. It’s not really about looks when it comes to food. 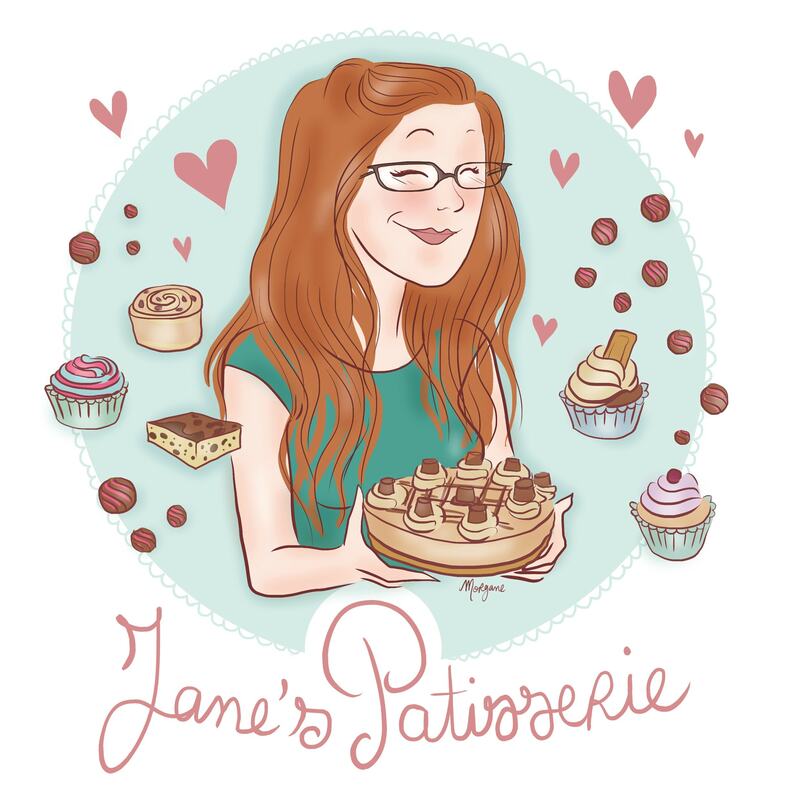 Sure, it does help if something looks delicious, and I find that the more delicious a recipe the more of you will look at the recipe, but seriously… when I bake at home for myself, I don’t faff about with it all. It’s ALL about taste to me! However, this just happens to be so incredibly easy to make, AND looks INSANE. I decided to use Carnations Caramel for my caramel layer as the amount in the tin is perfect for me. You can either use Carnations Caramel, any other caramel, Dulce de Leche etc – a thick caramel sauce is all you need! 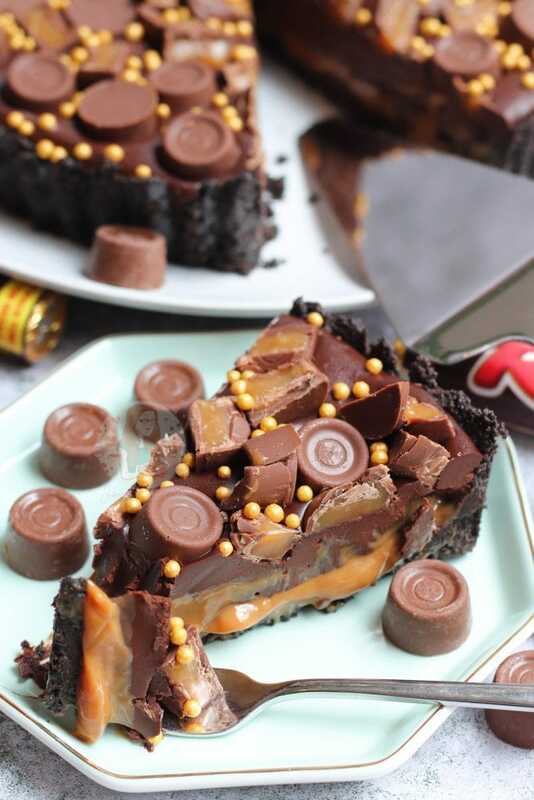 I don’t personally think it needs salting though to make it Salted Caramel like my Salted Caramel Chocolate Tart as the Oreo Crust and Dark Chocolate filling is enough bitterness for me, but this is personal taste! If you want to use Milk Chocolate, you can! However, it does make it very sweet. You also need to use only 250ml of double cream, and 35g of butter, as the milk chocolate makes it slightly runnier so you need more chocolate in comparison to cream. I wouldn’t recommend white chocolate for this however as that would definitely be too sweet. 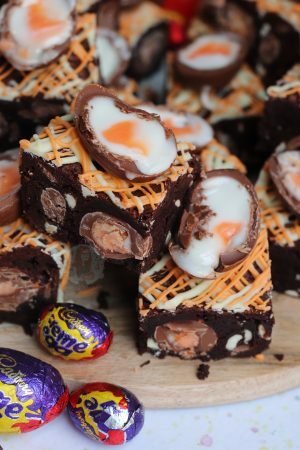 You can also swap the Oreos up for something else, but as I have already mentioned I utterly adore them in this recipe. Instead, you could use Digestives, golden Oreos, or anything! You just need the same amount of biscuits, and roughly the same amount of butter. Also, for the Oreos, you don’t have to remove the centres if thats something you’re worrying about. I keep them in and save the effort! I really hope you guys love this recipe as it is DEFINITELY one of my new favourites – let me know how you get on! Imma go make another one and eat it all to myself. Yay. 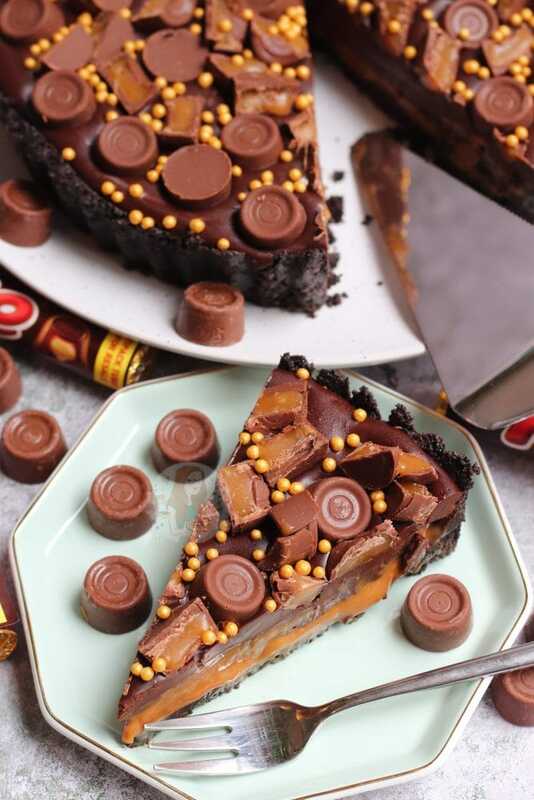 A delicious No-Bake Rolo Tart that will be the perfect Showstopper for any occasion! Oreos, Caramel, Chocolate and oodles of Rolos! Using a food processor, blitz all of the biscuits to a fine crumb, and mix in the melted butter. Press this into the sides and base of a 23cm Pie/Flan tin (mine was 3cm deep). Chop the chocolate up finely and put into a bowl along with the butter in cubes. In a small pan, heat the double cream until just before boiling point. You will see it starting to bubble at the sides. Once hot, pour over the chocolate and butter and beat with a spatula! If the chocolate hasn’t fully melted by this point, heat it in the microwave in 10 second bursts, stiring every time! Once the mixture is smooth, spread the tin of caramel onto the bottom of the Oreo base (It might be easier to beat the caramel slightly to loosen it first). Once on, spread the chocolate mixture onto of the caramel. Add the Rolos and halved Rolos to the top like you can see in my pictures and sprinkle on your sprinkles. Doing this now will mean they will set into the dessert so they don’t fall of everywhere! Leave to set for 3-4 hours, or overnight. Carefully remove from the tin, and enjoy! Serve with a dollop of cream, or on its own – yum! 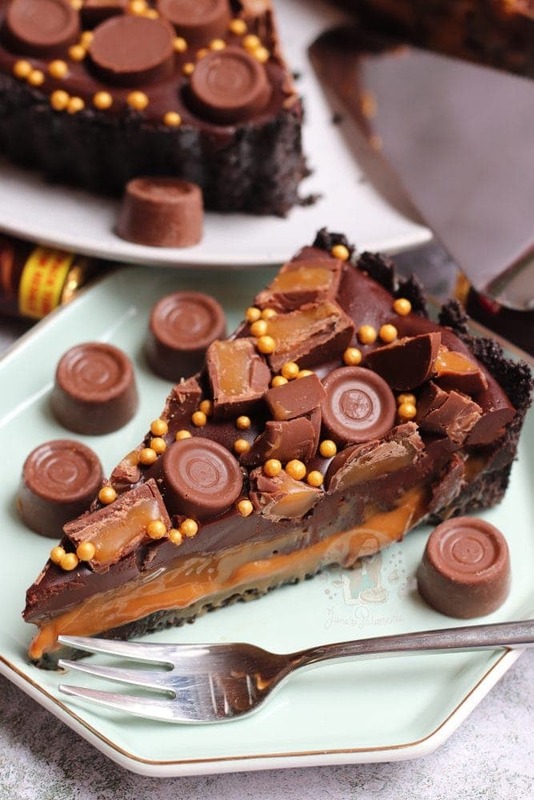 I used Dark chocolate in this dessert as the Rolos and Caramel layer are really sweet, so the bitterness of the chocolate is the perfect marriage in my mind! Older Next post: No-Bake Rocky Road Cheesecake! Newer Previous post: Caramac Cake! How big is the tin? I really want to try this out, I love the idea of an oreo base! I have never heard of a tin of caramel. Is there an alternative? 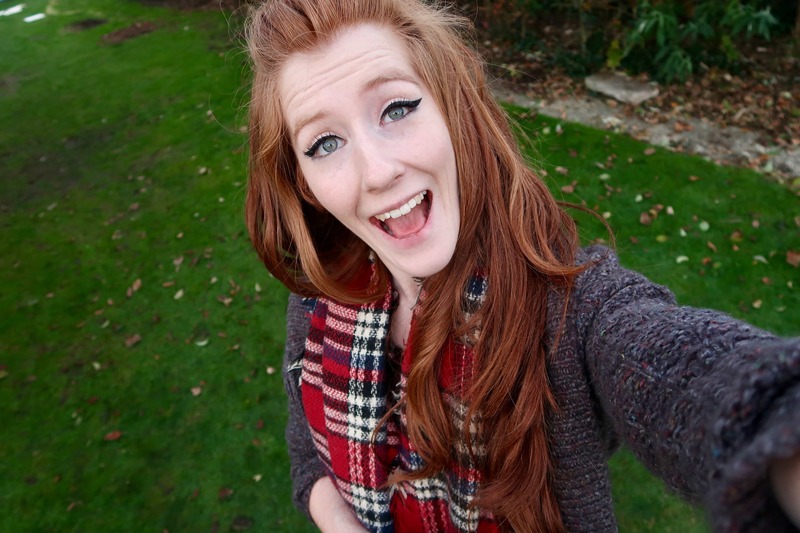 Hiya I don’t know if I can get tinned caramel in any of my local shops! Is there any thing else I could use? Hi, I don’t like Oreos (sorry!!). What can I use as an alternative for the base, thanks. This dessert will last in the fridge for 3days, covered. – I love your sense of humour! 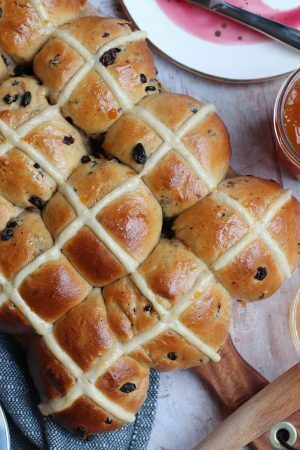 Great recipe, have made it a couple of times and it’s gone down very well! Have you ever frozen it before? I’m making it for a birthday party and would like to make ahead and freeze. Did you end up freezing it? I would like to try as well. do i have to take the cream out of the oreos before i blitz them to make the base? Do you put this in the fridge to set immediately or leave out? You put it in the fridge to set.. it shouldnt be out of the fridge as it contains a lot of cream. This looks delicious! That chocolate ganache filling and caramel, just wow. 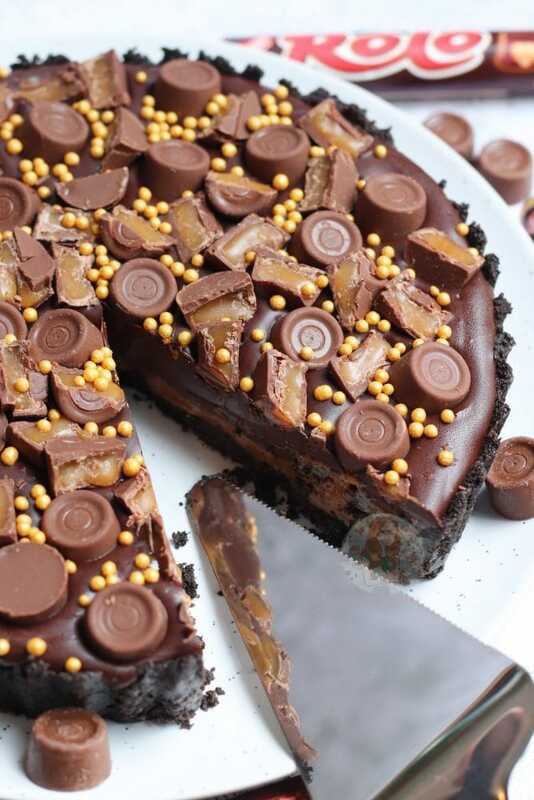 Definitely need to whip up one of these and I love an oreo crust too! Ohh thank you, Kathryn! ❤️ I can’t resist an Oreo crust, so yummy! 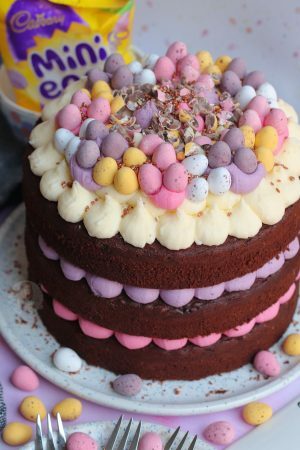 Just a quick question for birthday preparations – my tin is 30 x 3 cm, so could I just do the trick you mention in the tips and ideas section? Since that tin is smaller than mine (although bigger than the one in the recipe) but higher, it should even out I think? Thanks for your help! Looks amazing! Can’t wait to devour it later at the dinner party we are off to. Thank you for your recipes. They’re always my go to! Do you scrape out the centre of the Oreos or are they mixed in to the base? ? It won’t last in my fridge for 3 days!! Looks fantastic. This looks amazing! I really want rolo’s now. Oh. My. Word. This looks incredible. Just showed my kids this picture and they want to know when I’m going to make it !! This looks incredible! And now I’m craving some haha.